With their aviator models over the years, Breitling had a wide range of clients ranging from everyday watch lovers to professionals. Now they aim for the top of the diving watch segment. Today we got our hands on to the brand’s successful SuperOcean II 44 model. Although I like Breitling as a brand, I do not have a lot of experience with them. I always found it bizarre that on one hand they design and manufacture a lifesaving tool model like the Emergency, on the other hand they produce watches with overly busy dials and 50mm cases. 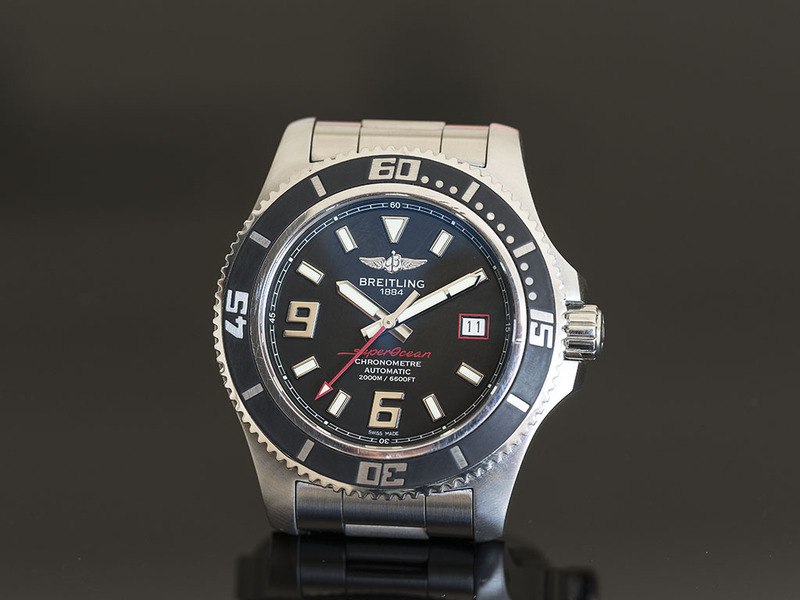 Over recent years, I have used a Breitling SuperOcean SteelFish X-Plus for a while. It was a diving watch, which gave a real robust and quality feeling.I liked its detailed workmanship and the watch’s overall appeal, but our journey together ended rather soon and I never got another Breitling ever since. Frankly speaking, I do not really like aviator watches. Most of the time I do not even like a date window on such busy dials.When it comes to overly complicated bezels with too many markings I turn away rather quickly. Diving watches however are a league of their own. When I heard about Breitling updating their SuperOcean series I instantly visited Tektaş Saatçilik and played around with it for a little. 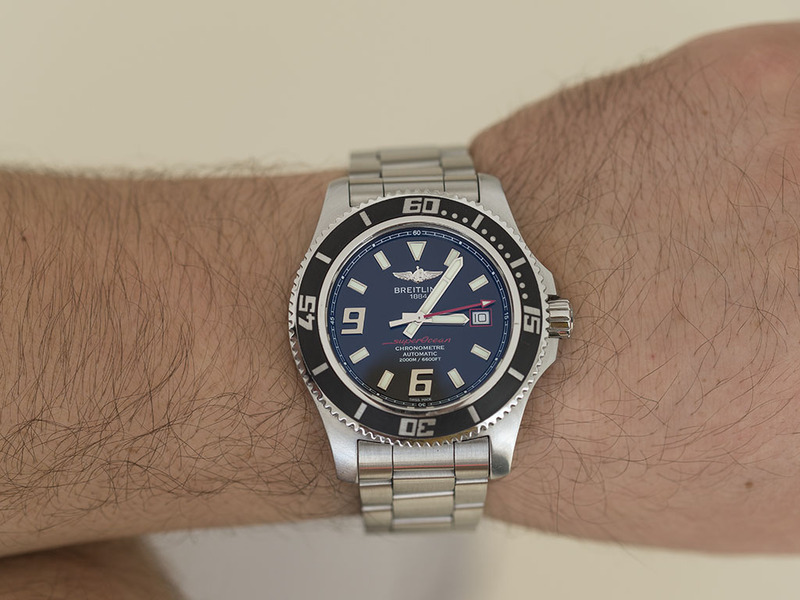 After a while I found out that our photographer Emre’s brother has a Breitling SuperOcean II 44 so I immediately asked him if I could borrow the watch for a couple of days. Here are my impressions together with the photographs from Emre’s perspective. First of all the watch gives you a real quality feeling from the very beginning. 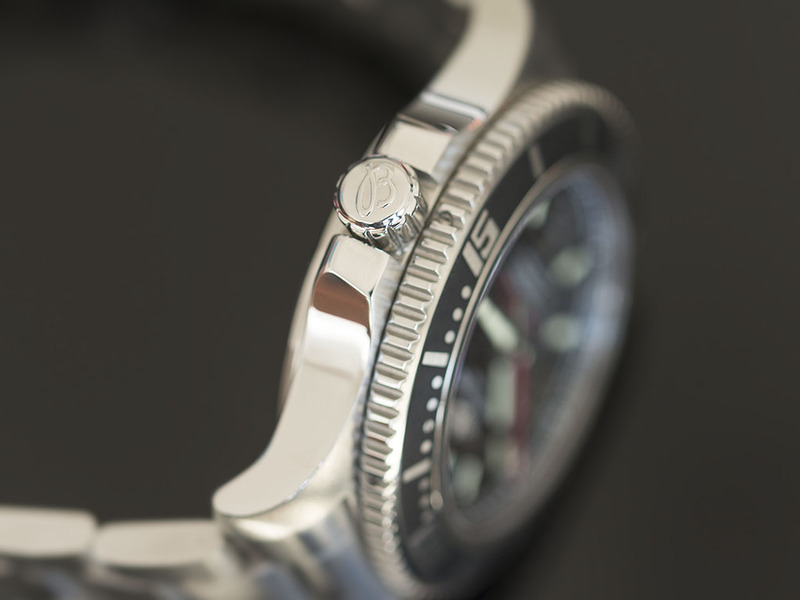 The workmanship on the case and around the dial gives you what you would expect from Breitling. As it is a diving watch it does not vary much from others, but when you go into details, you can discover the SuperOcean’s differences. The case measures at 44mm. With its 16.4mm height it wears rather big on the wrist. On the left side of the case (as expected from a watch with water resistance up to 2000m) there is a helium valve. 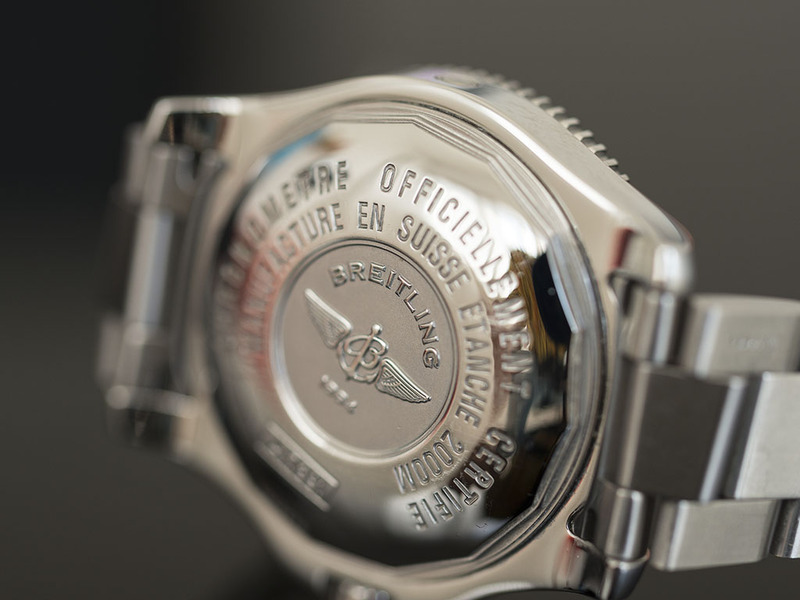 Well, the case-back design is a Breitling classic. 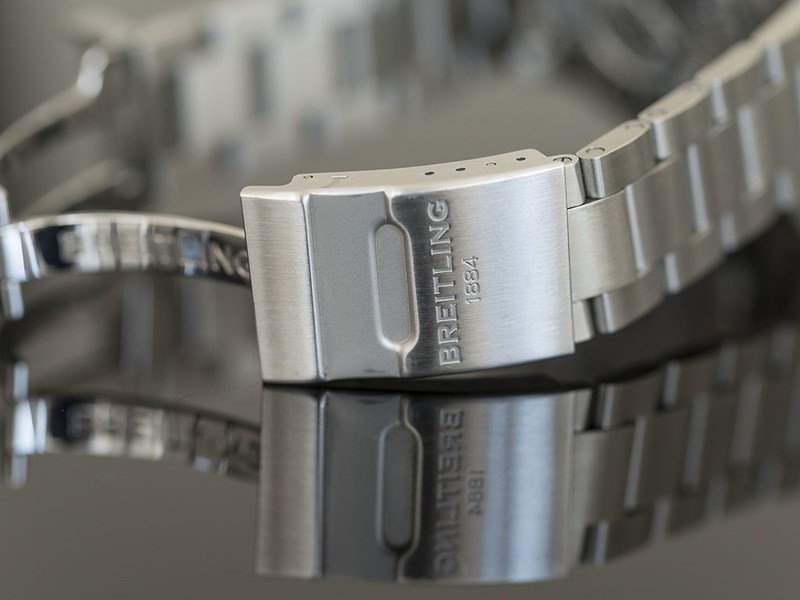 You can find some information about the watch engraved into the metal.The B marking with Breitling’s handwriting on the crown gives a nice touch to the watch. 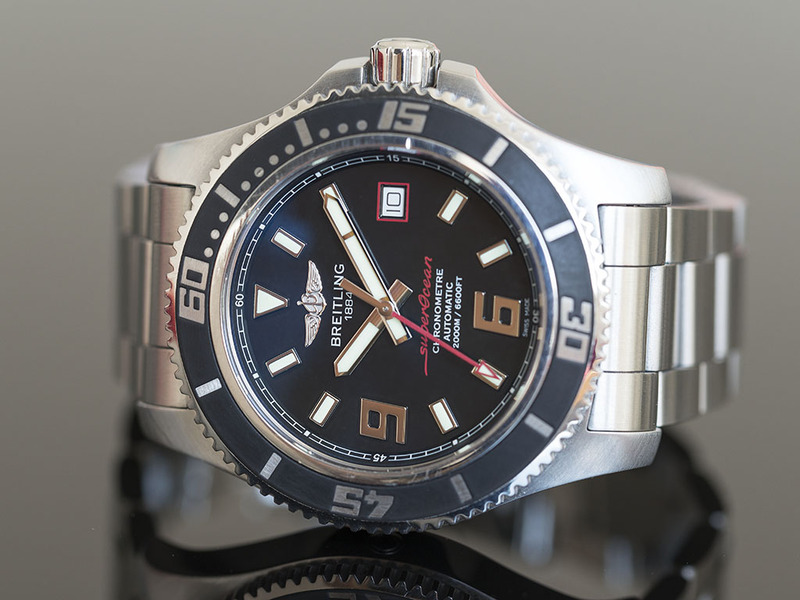 The watch’s bezel reminds you of a classic diver’s watch but the interesting part is that Breitling has used rubber as the bezel’s insert.Visually it looks elegant and pretty useful because of its anti – reflective nature but it is hard to tell how it will age. The watch’s bezel that I got my hands on looked like new. The dial features a nice matte black color, with sword shaped hands and baton indexes.This design looks really great and ensures good readability.At 6 and 9 o’clock Breitling has used quite big and bright chrome Arabic indexes. I would not like to talk about the design part but I do not really prefer big indexes on diving watches. Do not let me start about the watch’s size combined with these big numerals, as in my opinion it does not benefit the watch’s tool watch appeal. The date window is positioned at 3 o’clock. I personally feel like that the date window spoils the dial’s integrity.At least they could have made the windows background black and the markings white. Along with the writings around the dial especially the SuperOcean marking is quite nice. They used the same red color on the second hand and the date window. The glass is made out of sapphire crystal and has AR coating from both sides. As the matte dial has already been successful regarding reflections, the AR coating makes it impossible not to be able to read the dial. The watch’s bracelet belongs to on of the brand’s most successful designs. The PRO II. Is almost like Breitlings signature when it comes to bracelets.When I tested out the Breitling mentioned above I also used it with a PRO II. bracelet. The double sided folding clips look quite nice on the watch and grant it with an elegant and refined look.Inside of the watch beats an ETA 2894-2 caliber. I would like to point that it has a COSC certificate, which means its quality is not even a question. 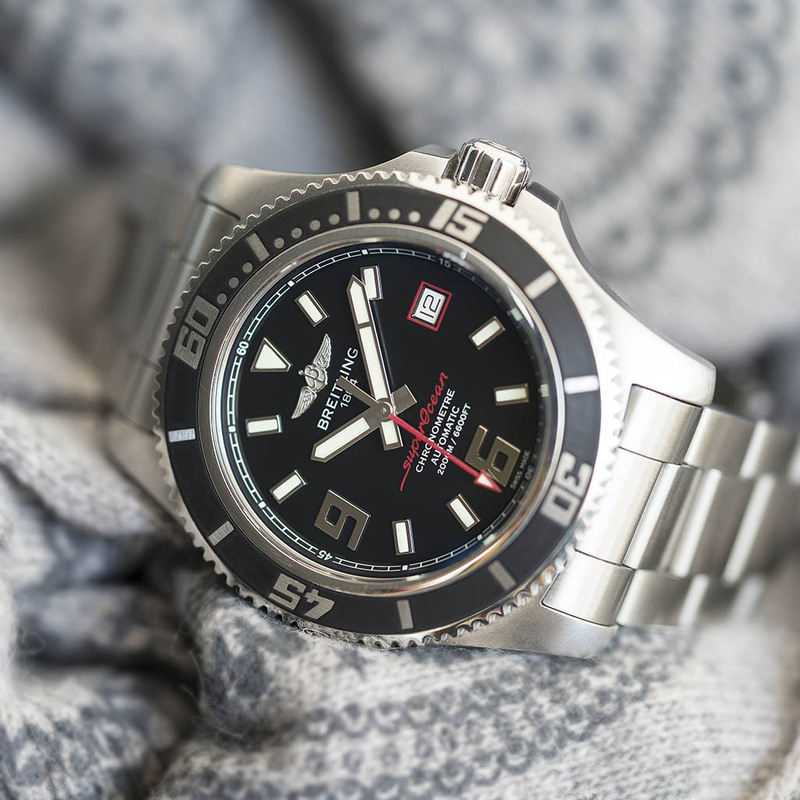 As a result, I really liked the SuperOcean II.Whatever attracted me when I bought my SteelFish – X plus, this watch has the same things for me. A negative thing about the watch are its big Arabic numerals, but it will certainly not spoil the watch when it comes to its overall look.